Alpaca farming's getting big around here, too, I've noticed. For meat and jumpers, I guess, or maybe just jumpers. I've got a friend in Columbus who lives not five minutes down the road from an alpaca farm-- they make a lot of trips down there so their daughter can pet them. You'll have missed glimpsing Natalie Portman by several months, then! (Which can only be a blessing.) I keep meaning to visit Ely Cathedral when I'm over, but never seem to get there. Did you have a look while you were there? Are you absolutely 100% sure they were not pushmepullyous? I have heard of them cropping up in your part of the world from time to time as well, and they really look quite similar, especially when moving in a herd. 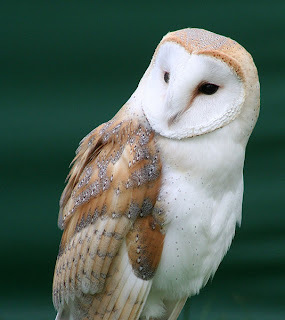 I am exceedingly jealous that you saw a barn owl! They are really such elegant creatures and their faces are so seemingly un-bird like. We don't get many barn owls down here in the big smoke. Nor much else for that matter. Though there is a persistent wood pigeon that my Dad is forever shooing away fromt the bird feeder. Was this at the alpaca-trekking place? I am pretty envious of the owl as well as I have only seen 1 in my two years back here and I came back because I MISSED the wildlife. I assume you were going to a different non welsh Ely because when people say "we had an adventure in Ely" it usually involves bricks through windows and your car lit with petrol. Jess, we were only very briefly in Ely, but being so flat around there you can see the Cathedral for miles. I can't remember if I've ever been in it, but it looks magnificent from the outside. Sara, great minds think alike, and I did consider this possibility. AJ said there are no such things as pushmepullyous, but I'm quite sure Rex Harrison would never have been in a movie which wasn't based on solid fact. Fluttertongue, I like pigeons too, although my Dad dislikes them. It seems very odd to live in the country and complain about the pigeons. It is rather like when we lived in Whitby and people complained about the seagulls. Mary, no, I looked on-line and found it was a farm which was actually attached to a children's nursery, so the kids could help look after them, which I thought was very sweet. Elizabeth, yeah, this is Cambridgeshire Ely as in Hereward The Wake and all that. I didn't even know there was an Ely in Wales, boyo. Although it was Boxing Day, and I had indulged a little the day before, on our 'walk' in North Dorset my companions and I were assured that yes, that is a herd of alpacas gallumping towards us; apparently they are guard-alpacas, to keep the foxes away from the free range hens. Country life, I love it. When it is a full hunting moon under clear skies, an owl sits on the roof near the warm chimney pots and hoots to the other owl(s) sat on other roofs with warm chimney pots. No ostriches. We see the occasional fox by Otterspool rubbish tip (I'm sure the council calls it something more savoury sounding than that!). Looking forward to the Swifts arriving - wonder if they will be early this year.